Divya Nedungadi was born on August 06, 1988. She started learning Classical Dance at the age of 4 under the tutelage of Smt. 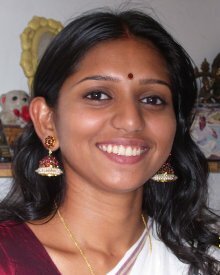 Vinitha Nedungadi, one of the famous present day exponents of Mohiniyattam. Divya is a Graded Artiste of Doordarshan, the official channel of Government of India. Besides Doordarshan, she has performed in most of the Television channels. Divya has performed extensively at various places in South India and had the fortune to perform in Maldives along with her Guru in 2007. She is a recipient of National Level Scholarship given to Young and Upcoming Artistes for conducting Higher Studies in the field of Mohiniyattam by Ministry of Culture, Government of India in 2008. Besides Mohiniyattam, she has mastered in Classical Music and Sanskrit too. Divya is married to Shri. Mani G Marar. Divya secured First Rank in BA (Sanskrit Sahitya) from Calicut University 2006 -2009 Batch and stood TOP in MA Dance (Mohiniyattam as Major Subject) from Sree Sankaracharya University of Sanskrit, Kalady (2009 - 11 batch). Also cleared University Grands Commission's National Eligibility Test for Lectureship (UGC - NET).